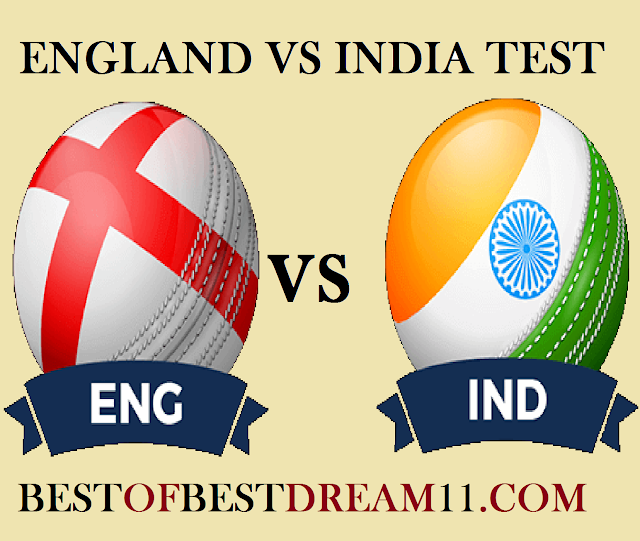 Here is best "ENGLAND VS INDIA" 4th Test match, DREAM11 Predictions for the Fantasy user ,who venue are looking to make a strong team for maximum win. We are providing latest news, match update, information about the match .The team is picked by using various factors on the basis of performance, ground stats and latest form. "After losing the first two matches, the Indian team made a great comeback and defeated England by 203 runs in the third test match. The Indian team will want to equalize the series by winning this match by 2-2.The same England team will try to make the series their name by winning this match. For India ,Virat Kohli is in great form,he has scored 440 runs in five innings of the Three Test played so far.In the last match,he scored 93runs in first inning and 103 runs in scond inning. Ajinkya Rahane(81+29) and C Pujara(14+72)have return in form after playing a good innings in the last match. Jasprit Bumrah(7wt),Hardik Pandya(6wkt) and Ishant Sharma(4wkt) had a great bowling in the last match. For England, Alistair cook's form is not good and so far he has not done anything special in this series. Jos Buttler(39+106) batted brilliantly in the last match.Ben Stokes also picked up a good wicket while making 62 runs in second inning in Third Test. James Anderson (17wkt)is most successful bowler in the series,along with Chris Broad and Adil Rashid have also done well. Sam Curran performance was spectacular in the first two tests,he scored 126 runs and took 6 wickets in three innings. England have announced their playing xi for the 4th test match.Chris Wokes and Olie Popes is out of the team ,Sam Curran and Moeen Ali have been brought in their place. Johny Bairstow will play this match as speacialist batsman. The Indian team will not make any changes with their winning combination .